Coyotes and stray dogs are increasing in numbers and have become an extreme danger to lambs. Stray dogs can cause more trouble than Coyotes. One or two stray dogs have the ability to destroy and maim dozens of sheep in a single night. Coyotes primarily make one kill to feed while dogs find it to be more of a sporting event and thrill of the kill. Killings usually occur at night or very early morning. It's important to employ a sheep guard dog for protection of the herd. Guard dogs are on duty 24/7 and they are most alert during times of greatest danger. 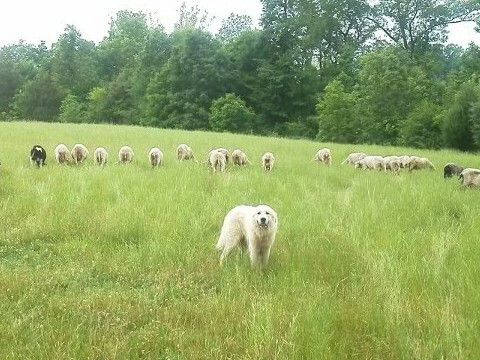 At Karras Farm we breed Anatolian Shepherds to protect our East Friesian dairy sheep. 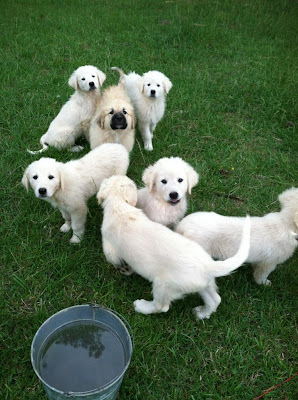 The Anatolian Shepherd is known for excellent sheep herd protection and they integrate well with new lambs during birthing season. Guard dogs are not family pets; they are working dogs and should be integrated with the herd at all times. Karras Farm offers a limited number of Anatolian Shepherd puppies to our existing customers. If you have an interest in learning more about guard dogs or future availability of our pups please feel free to contact us. Thank you and best wishes with keeping your animals safe from predators. The life expectancy of sheep is similar to a large dog breed of about ten to twelve years. Some sheep breeds are known to have a longer life cycle such as the Merino. According to the Guinness Book of World Records, the oldest sheep lived to be 23yrs. She was a Merino however; the length of a sheeps productive cycle is much shorter. A ewes offspring production is highest between three and six years of age and usually starts to decline after age seven. As a result, most ewes are removed from our flock prior to reaching their natural life expectancy. It is necessary to remove the older ewes in order to make room for the younger animals. As we mature our genetic line of sheep we must provide an adequate environment for the younger sheep to thrive. In harder environments, where forage is sparse, ewes are usually culled at an even younger age due to tooth ware and break down. It can become difficult for sheep in these conditions to maintain proper body condition and consume enough forage to feed their lambs. It is possible for a ewe to be productive past ten years of age and stay healthy but this is typically the exception to a natural sheep life cycle. Hope all your lambs are happy and healthy!